Shred Connect is the best option for any secure document shredding Newport Beach, CA. Whether your task is large or small, personal or corporate, we will handle it professionally. Everyone needs document destruction to maintain your confidential information against theft or to secure your client’s information from unscrupulous sources. We are hired for this main purpose, so how do you know your information is safe with us? Simple. We stake our reputation on it. 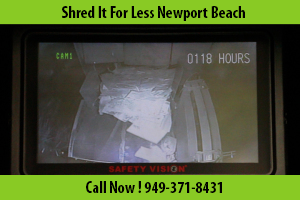 Watch as your document shredding Newport Beach is completed by a mobile shredding truck or at a drop-off site. Receive a Certificate of Document Destruction as proof. Know that we do not keep your shredded paper on site, but send it out to be recycled and further reduced as our pledge to be environmentally conscious. Document destruction is an important housekeeping duty, and we will promptly release you from its burden. As the old saying goes, “Time is money,” but at Shred Connect secure document shredding we see it another way. Time is respectful; time is professional; time is reputation. We will always be on time as a courtesy to you and out of respect for you as a person, as our professional duty and word, and because we said we would. Whether we are called to come pick up a recycling receptacle or our truck has an appointment for a large shredding job, we will be there when scheduled and will professionally complete the job in minutes. With twelve locations and counting, Shred Connect secure document shredding is largely available to customers in Newport Beach and the surrounding communities. We offer multiple, central Drop-off locations in each city which are available at your convenience. Whether you only have a few minutes at lunch to drop off your boxes or find yourself running errands after 8-pm when the kids are in bed, you can check paper shredding off your To Do list. If you’d rather Shred Connect mobile shredding come to you, we can arrange a time to pick up your confidential documents from the workplace or your home. Our mobile document shredding truck will arrive for large jobs which require on site shredding and our crew will haul boxes out to the truck for you with minimal disruption to your home or office. For smaller jobs, you can arrange regular pick-up of materials or call as you need us for document destruction. We pride ourselves on flexibility and convenience, and will accommodate your schedule to make secure document shredding as easy as possible for you. Our prices are the most affordable in the Newport Beach paper shredding services market. We keep our prices low, because while we are a business who wants to prosper, we won’t do it by gauging you or your business. We grow by gaining new customers through referrals and low prices as well as keeping our current customers coming back through superior customer service. We will beat any competitor’s prices by a healthy margin. Our mobile shredding office staff regularly checks out the competitor prices to ensure we are meeting our guarantee. Shred Connect secure document shredding offers the vast serviceability of a company with one goal in mind: to please and honor our customers. Call us to hear what we can do to meet all of your secure document shredding your needs.